OMEGADYNE® offers K-Series strain gauges for shear and torsional strain applications. These strain gauges can be used in transducer design for shear beam load cells. They can also be used for reaction torque on a shaft. Single strain gauges are available, SGK-SS3A-K350U-**** and matched, but with opposite grid angle is the SGK-SS3B-K350U-****. The SGK-SD3A-K350U-**** and the SGK-SD3B-K350U-**** have 2 shear strain gauges, with opposite grid angles, on one carrier, with separate leads/tabs(electrically independent). 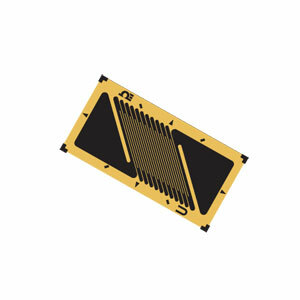 The SGK-SDH3B-K350U-**** has 2 shear strain gauges, with opposite grid angles with a common lead/tab.